A big part of Ocean Friendly Gardens is CPR: Conservation, Permeability and Retention. Here, we wanted to focus on the Permeability and Retention. Throughout most of Southern California the ‘old school’ thinking was that we need to get rid of all of the storm water from homes, parking lots, etc. rather than finding ways to let it soak in to help replenish and recharge local aquifers, support native plants, etc. The area around Sunset Cliffs Natural Park is no exception. A large residential area is above the linear or norther section while Point Loma Nazarene University surrounds the hilltop or southern section of the park. Both have accelerated runoff, pollution and erosion in the park over the years. 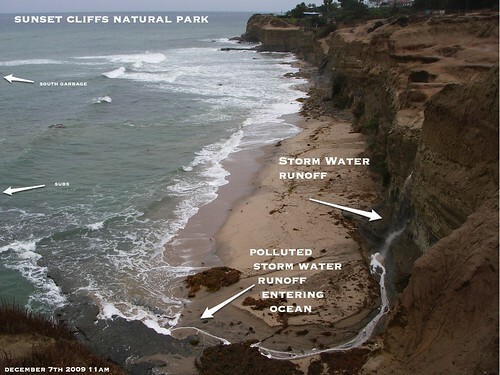 Currently the City of San Diego is working with the Sunset Cliffs Natural Park Council to develop a drainage plan for the area. Recently, Surfrider was able to document some of the drainage issues and we look forward to being involved in the drainage project. Click Here for more photos.